Complex Survey Data Analysis with SAS® is an invaluable resource for applied researchers analyzing data generated from a sample design involving any combination of stratification, clustering, unequal weights, or finite population correction factors. After clearly explaining how the presence of these features can invalidate the assumptions underlying most traditional statistical techniques, this book equips readers with the knowledge to confidently account for them during the estimation and inference process by employing the SURVEY family of SAS/STAT® procedures. The easy-to-follow examples are drawn from real-world survey data sets spanning multiple disciplines, all of which can be downloaded for free along with syntax files from the author’s website: http://mason.gmu.edu/~tlewis18/. While other books may touch on some of the same issues and nuances of complex survey data analysis, none features SAS exclusively and as exhaustively. Another unique aspect of this book is its abundance of handy workarounds for certain techniques not yet supported as of SAS Version 9.4, such as the ratio estimator for a total and the bootstrap for variance estimation. Taylor H. Lewis is a PhD graduate of the Joint Program in Survey Methodology at the University of Maryland, College Park, and an adjunct professor in the George Mason University Department of Statistics. An avid SAS user for 15 years, he is a SAS Certified Advanced programmer and a nationally recognized SAS educator who has produced dozens of papers and workshops illustrating how to efficiently and effectively conduct statistical analyses using SAS. ... Complex Survey Data Analysis with SAS is a very clear and concise reference for practitioners, students, and researchers who are interested in learning how to analyze data from complex surveys using the SAS statistical environment. The prominent feature of the text is its very clear exposition of concepts in survey statistics combined with implementation code. The author uses clear language, intuitive graphics, contrasts, and real examples to achieve this goal. Although the book is posed primarily as a handbook for SAS (as the titles of the chapters suggest), it nevertheless presents the concepts so clearly that it can also be regarded as an introduction to complex survey analysis. … SAS code to demonstrate analysis of complex survey data is fully reproduced and clearly annotated in the text together with the output. The author makes a fascinating job in clearly walking the reader through the code and interpreting the results. This feature makes the book an indispensable resource for self-learners and practitioners who need a handy reference for using SAS in complex survey analysis. 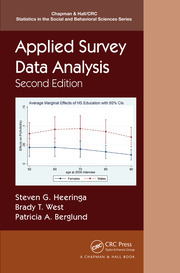 … Overall, this is a well-structured and practical desk-side reference for students, practitioners, and self-learners who are interested in performing different data analyses on complex survey data using the SAS statistical software." "…. Lewis has adopted a slightly different approach by illustrating survey design effects with SAS codes and shifting more technical topics on variance estimation and weight adjustment toward the end of the book. I found Chapter 2 particularly refreshing as popular sampling techniques (e.g., probability proportional to size sampling, stratified sampling, and cluster sampling), which are common in population-based surveys, are demystified through computer codes. Throughout the book, SAS codes are presented in a self-contained manner, numbered consecutively with self-explained titles … This approach makes it easier for readers to practice working examples and to adapt the codes to their own work. … Complex Survey Data Analysis with SAS is a welcome addition to the few textbooks and desk-side references that not only introduce the key concepts underlying complex survey data, but also demonstrate practical analysis using modern software packages. Applied data analysts will find the discussions of statistical theories accessible. 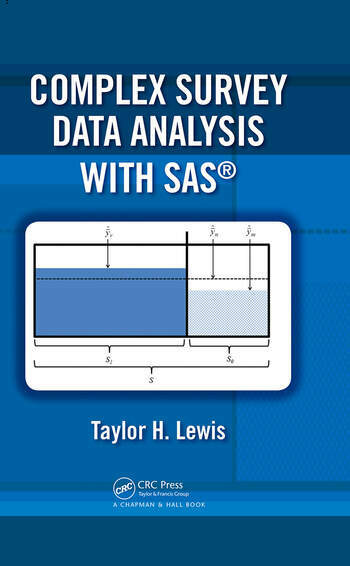 SAS users will certainly appreciate its systematic survey of existing procedures and will get a copy as a handy desk-side reference just as the author intended …"
"… many researchers who encounter more complex surveys are challenged with identifying the right design and finding a program to carry out the data analysis. This book nicely fills that gap. It provides some statistical reasoning and outlines some mathematical procedures but does not go into much detail and can be read by someone without advanced training in mathematical statistics. … Throughout the book and for each method, the author provides detailed information on how to implement the procedures in SAS, the SAS code and also motivation. 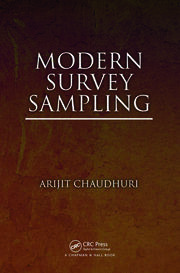 The book can be used by a reader with little knowledge of the mathematical details of survey sampling in general and complex surveys in particular. It does require some understanding of clustering and stratification. It is helpful, though not necessary for successfully using the techniques presented to have some understanding of calculus such as Taylor series approximation. Some basic knowledge of statistical inference is also required. It is a very useful book for planning and implementing a complex survey and analyzing the data from such a survey. 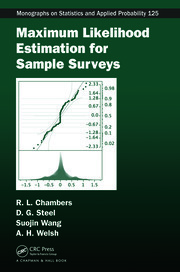 … It will be a useful reference and additional resource in a statistics course on survey sampling ..."
"This book is very well written and includes a wealth of theoretical and practical information. It hits the mark on the explanation of concepts and statistics in that it is readable without being too simple or advanced. It will be an excellent resource, especially for SAS users." "Building from simple motivating examples to real-world data sets and analyses, this book clearly demonstrates SAS's suite of survey analysis commands. Lewis explains why special commands are needed when working with survey data, how to run the code in SAS, and how to interpret the output. This book will be useful to many, in particular to researchers who have a basic knowledge of SAS and statistics but are new to analysis of survey data." "This book is an outstanding, practical handbook presenting thorough examples of the use of specialized procedures in the SAS/STAT software for dealing with all aspects of complex samples, from sample design and selection to the analysis of complex sample survey data. Applied statisticians, survey researchers, and analysts of survey data collected from large, complex samples in applied fields, such as epidemiology and public health, will find this book to be a tremendous and essential resource on the use of SAS for managing and analyzing these types of data sets…Overall, I would highly recommend this excellent new resource for any researchers selecting complex samples and analyzing complex sample survey data using the SAS system."